Major "Boots" Blesse was in a tight spot. This mission on 3 October 1952 was his 123rd, two away from the end of his tour. With nine victories to his credit, he was the leading ace in Korea. But now, over North Korea and 200 miles away from home base at Kimpo, he was sweating out making it home with the 1,100 pounds of fuel he had left. Minutes earlier, he and his wingman had been attacked by four MiG-15s. In the dogfight that followed Blesse had damaged one MiG, forcing two to break off. Sending his wingman home to safety, he then out maneuvered the remaining two MiGs and headed home himself. Climbing out he caught a glimpse of a MiG-15 crossing left to right in front of him. He looked at his fuel gage and thought, "Hell it's a toss-up anyway. Why not?" and turned into the MiG. Closing to 600 feet, he fired until the MiG started burning and the pilot ejected. "There went number ten," Blesse thought, but now he was down to 900 pounds of fuel. Calling "Dumbo," the rescue flying boat that was on station for such emergencies, Blesse made for the coast. 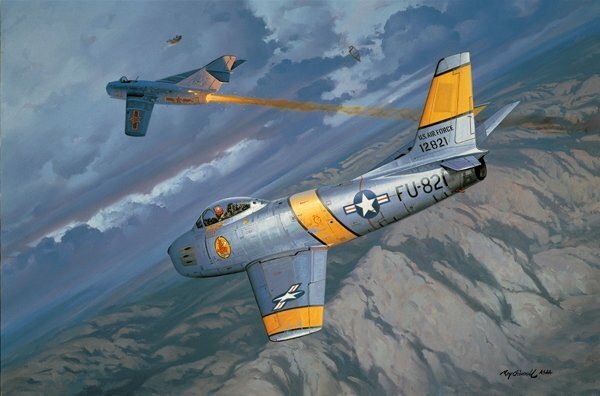 His F-86 flamed out at 13,000 feet, but his glide put him across the North Korean coast at 3,000 feet and he ejected. "Dumbo" landed alongside his dinghy and flew him back to Kimpo. The next day the leading ace was at a press conference in Japan and then on his way home. Hand signed by Ace Frederick Blesse and artist Roy Grinnell. Overall size of this lithograph is 24" x 30".